The 850nm IRC182 Series Medium-Range IR Illuminator from Iluminar is designed to provide IR lighting for CCTV systems. 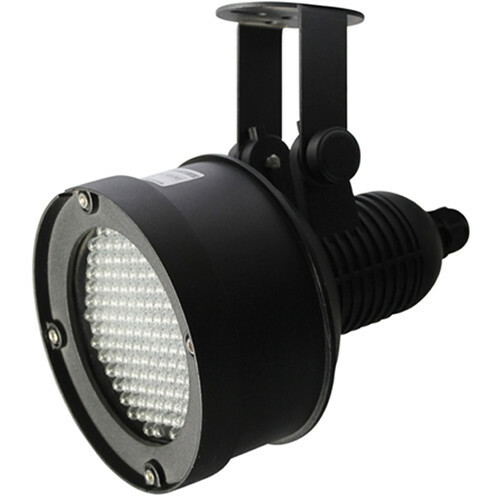 It offers and illumination angle of 120° and has a range of up to 66'. The IP66-rated and vandal-proof IR illuminator can be used outdoors. The tempered glass panel and die-cast aluminum housing provide protection from harsh weather conditions and rapid temperature variations. Note: Viewing distance tested using Sony 1/3" CCD camera with 0.01 lux. To achieve the distance needed, please check your camera and lens specifications prior to purchase. IR illuminators require true day/night camera with mechanical IR cut filter. Distances realized may vary due to different camera and lens specifications. Box Dimensions (LxWxH) 12.0 x 8.4 x 7.4"